When we identify need areas in our community, we often provide the seeds to create projects to meet those needs and identify partners who join us to greater mutual reward. Under this rubric, we started a world-recognized artist in residence program called The Betsy Writers Room (www.thebetsywritersroom.com), LGBTQ programs including TransArt, musical programming including The Betsy’s A Capella Festival, Escribe Aquí Iberoamerican Literature Festival, and The Betsy’s Yiddish Culture Program, among many others. We also provide in-kind products and services, such as giving non profits a place to convene, underwriting for entertainment and refreshments, and volunteer support. In an article, entitled “Citizen Hoteliers,” that appeared in Hotels Magazine, Betsy Chairman Jonathan Plutzik commented, “When we created The Betsy, we felt strongly—both as a business and a personal matter—that the hotel establish itself as a philanthropic charitable force.” From subsidized ‘friend-raising’ events for critical causes, to collaborative community programming, Betsy’s partnership model is based on shared ideals. Visit the philanthropy page at thebetsyhotel.com/culture to learn more. 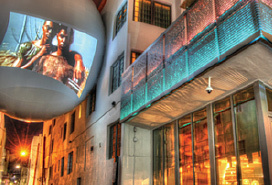 The Betsy Hotel’s Orb & Poetry Rail illuminated for Pride Poets Light the Night, which featured Inaugural Poet Richard Blanco reading his poem One Pulse, One Poem, 2017. The Betsy Writers Room hosts Amy Tan, author of The Joy Luck Club, through its Writer’s Room program which has hosted 500+ artists in residence since 2012. 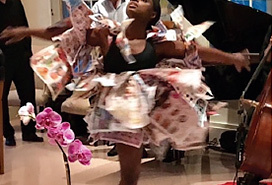 The Betsy partners with Peter London Global Dance Company for exciting and unexpected dance and movement pop up performances to delight hotel guests and visitors, 2017.